it is all stock, but in BSPWM I am no longer able to play any games. There is some type of glitch where the video playback is stuck on the first frame and will not update past that. The game will be running properly and the sound will work and I can navigate menus ( I know this from the audio) but the screen is black unless it is one of the few games where I can still use my key bindings, in which the game will update to the current frame at the time of the switch from full screen to windowed or any change in focus, but will be frozen on that screen. There seem to be no errors logged, and I can run games fine on the integrated card and emulators seem to be unaffected , but non-steam games that I have binaries for like Xonotic are also fail to output video properly under bspwm only when used with the Nvidia card. The thing is, everything runs perfectly fine under gnome and cinnamon because I installed them both to test it and for some playing around and it all worked flawlessly. This has worked under bspwm before, and it is within the last month that something went wrong. Again no errors or anything seem to be reported, but if you guys have any ideas of something I should check please let me know. Its not a dire issue as I haven't the time to play games much which is why I cannot pin point the time when it stopped working, but it is inconvienent and I just want to let everyone know incase someone has a similar problem or some knowledge of what may be the matter. This has worked under bspwm before, and it is within the last month that something went wrong. Check pacman.log and try to find the last installed commit that worked. With this information, you can run a git bisect to find out the offending commit that introduced the bug. bspwm compiles in a couple of seconds, so It will be a matter of minutes. ^ @o_caino Thank you very much, I will be attempting this as soon as possible, however I am going to be very busy for at least a couple of days. As soon as I am able to isolate the problem or I find out anything, I will let everyone know. When tiling a floating window, can I preselect where it will be tiled? This only works if I preselect before opening the floating window. If I open the window, then preselect, it has no effect. Which window are you preselecting (/how are you preselecting it)? It works here. Oh, after I updated system it works! However, a problem with bspwm has occured: When I untile a tiled window, It looks as if nothing happened at all, but at once when I try to resize the untiled window, it instantly gets resized to its floating size, while the eventual other tiled windows stay in place until they are also resized by mouse; then they also swap into place and fill the space that the floating window left. Edit 2.. of course this has with what I was trying to achieve (preselecting floating windows) to do. My problem happens when I haven't preselected. Any way to check if there's an active preselection, or do you know a better way? Maybe you want to look into it (the shorthand version being bugged). The window's size (from xwininfo) is the area inside the white border. The outer transparent area does not register mouse clicks, but the area closer in - where you can see the shadow - is used a handle for resizing. ...or a request for ideas from the thread as to how I can make nautilus look less dumb. I would prefer to keep window borders if possible - they help me see which program has focus - but hey maybe there are alternative ways to accomplish that as well. Also, for now, you could write a custom rules script that queries the _MOTIF_WM_HINTS property using xprop and disables border-drawing based on it's value. Those gtk3 edits got me partway there. The shadow is gone and the margin (?) is a little smaller. I will have to mess around with it more. That might be due to your GTK3 theme. You can use gtkparasite-gtk3-git from the AUR to inspect the window borders. Nope, it is due to me being a doofus. I commented out the original .window-frame stuff, but failed to notice that there was a comment inside one of those blocks. I am a little surprised that my first edit appeared to work at all. Nautilus looks nice again. Still, it is weird to have to edit the theme like this. 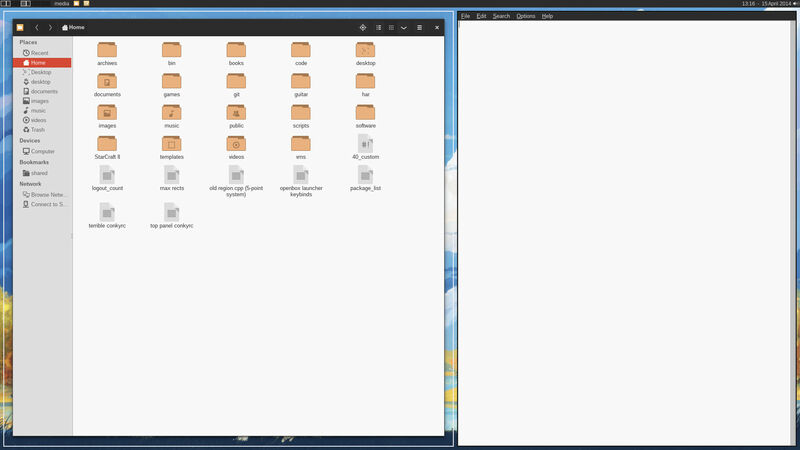 Gnome 3, as far as I remember, allowed one to tile windows to the left and right half of the screen without any gaps. Is there maybe a way to communicate to a window that it is tiled? but I could just be projecting. Bspwm would have to somehow tell GTK that it was tiling the window (probably doable but I have no idea how to do it). Regardless, while GTK (the window) can tell bspwm (the window manager) that it wants to draw its own decorations, it would be nice if there were a way for the window manager to tell the window "no really, I'm drawing the decorations, fsck off." - Is it possible to let the focus follows the mouse (Like i3wm does) instead of clicking on the windows for focussing ? - Is there any feature or application like the i3-nagbar (i tried running i3-nagbar in bspwm, but it looks horrible) ? But when i try to add the arrow thingys and icons it renders this: \f4\b7⮂, so how can i get those font icons ? \f4\b7 is bar's old syntax. To get the icons you must use the same font this guy uses. A question about these fonts: is there any place where i can find that kind of fonts with the icons in it ? Uushi has an installation script, and there is a list of the icons in it so you can copy and paste them. Stlarch also has some nice icons and is in the aur. If you download it from source forge, it comes with instructions for viewing and generating the symbols. All wms have 1. and 4. I am looking for the other two possibilities. Not sure how to do that yet (still expirimenting with BSPWM). You can use the monocle layout. Full "screen" Youtube - so without all chrome - inside a window Edit: yes I know it's an i3 pic. Is this possible in bspwm? Your screenshot shows mplayer, not Youtube. @ewaller Sorry for the link, thanks for fixing. @ o_caino Yes, it shows mplayer, this was the closest pic I could find I'd like to see the same with youtube (or ANY app), that is: have the app "full screen", so no chrome such as titles, bars, tabs, etc - but inside its own window/container. You can use mpv or vlc (maybe also mplayer, I don't know) to stream a Youtube URL. The result would be the same.